Was it just me or did you hear a rumour that snow was forecast for the end of October? Well there are only a few days of October left, and although it hasn’t snowed yet, it has been super cold, suggesting that snow may be on its way for November. Every single time it snows in the UK the whole population seems to come to a stand still. People stay off work, schools are closed and businesses make the decision to take a day or two off trading, whether this is an excuse to go out and have fun in the snow, or to stay wrapped up indoors varies from person to person. It seems that our country never really prepares well for snowfall – it’s a good job we don’t get a lot of it! Don’t get left in the cold, prepare yourself for the snowy, winter weather ahead by treating yourself to a warm, weatherproof duffle coat. Duffle coats have been worn by people for many years but were originally created for sailors in the Royal Navy. They have aesthetic features perfect for winter including double faced lining, to keep the cold out, and toggle fasteners which make it easy to do up your coat when you’re wearing gloves. Duffle coats usually have an over-sized hood that keeps your head and ears warm. You also have the room to wear a hat or earmuffs underneath if you feel the need to. If you’re fashion conscious, then you’ll be pleased to know that Duffle Coats rarely go out of fashion and are worn by many celebrities including Sienna Miller, Alexa Chung, and not forgetting Paddington Bear! 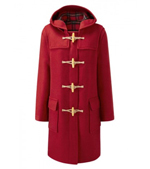 Your duffle coat will look great worn over jeans, or thick opaque tights if you’re wearing a dress. Team it with knee length boots, gloves and a lambs wool scarf, for added warmth. The duffle coat is a classic that will be wearable for many years to come. It will keep you warm throughout winter, spring, and even on those cold summer days – we do live in Britain after all.